How does environmental chamber work? Environmental chamber: how does it work? An environmental chamber is an enclosed space in which various environmental conditions such as heat and humidity can be controlled. Some chambers even account for corrosion through the introduction of salt spray into the chamber. The size of these chambers can vary widely depending on the product that needs to be tested. Sizes can vary from a cubic foot to up to 12,000 cubic feet, which is large enough to drive a truck into! What is an environmental chamber used for? The main function of environmental test chamber is to see how products handle operating in various environments. For instance, a car that runs very well in dry climates may stop working in humid environments. Environmental chambers allow product manufacturers to test their products under a wide range of controlled conditions without having to physically travel all over the world. Environmental chambers that have been properly calibrated can generate reliable results that reflect real-world product performance. So how do environmental test chambers work? The environmental chamber working principle is that all conditions can be controlled manually through a variety of mechanical processes. Temperature is controlled via electric resistor to either heat or refrigeration unit to cool the chamber. To simulate the corrosive effect of living close to the sea, a salt solution is sprayed through a nozzle into the chamber, creating a fine mist that coats the entire product. Humidity in the test chamber can be simulate by two different methods: evaporation of water with a heat source or with ultrasound technology. Water vapor is usually introduced into a test chamber via a steam generator which heats the water and creates steam. The steam rises to the top of the chamber, where it is cooled down again, raising the total humidity in the test chamber. This method is useful because it can generate high humidity in large chambers very quickly. The drawbacks are that it’s a very energy intensive process that can also affect the temperature inside the test chamber. Ultrasonic humidifiers don’t rely on heat to turn water into steam. Water vapor is created by running water on a diaphragm that vibrates at ultrasonic frequencies. The droplets formed by this method are extremely thin and can evaporate rapidly in the air in the test chamber. This humidified air is then transferred to the test chamber. 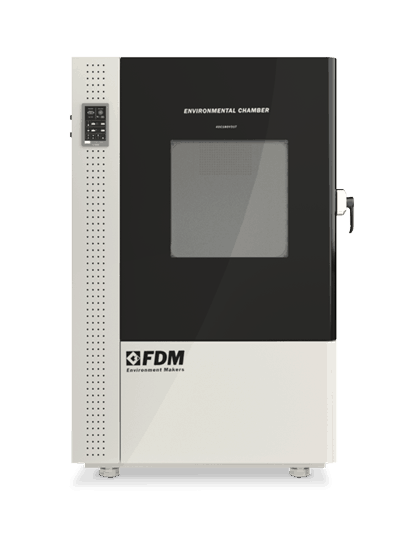 The system used in the FDM test chambers is more efficient than heating system. To ensure that the tests of products are accurate, manufacturers must know how to how to calibrate environmental chambers. If you want to know how is important to calibrate it, check this article. Proper calibration of test chambers is essential to reliable and consistent results. Various environmental chambers will have different calibration processes, depending on how the environmental chambers work and what industry the chamber is being used in, so it’s vital to contact the manufacturer of the chamber to find out what the correct procedure is before starting the calibration process.